A “NATURAL” sugar is still sugar. Avoid all sweet drinks, including juices, and soft drinks. Use Stevia, a herb, which is 1000 X sweeter than sugar and assists in balancing blood sugar levels. Eat right for your Metabolic Type! satisfy our sweet tooth was to eat foods where sugars occurred naturally. 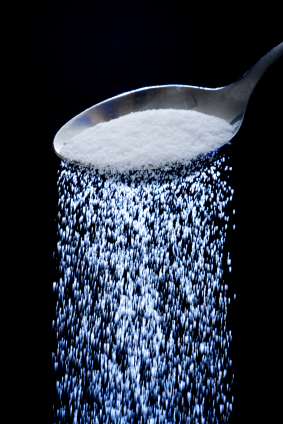 A century ago, the average intake of simple (refined) sugars was approximately 4 lbs per person per year. Nowadays, North Americans consume an average of 150-170lbs per year! It’s not hard to see why 60% of the North American population is overweight or obese. The reality is processed sugar wreaks havoc on our bodies. 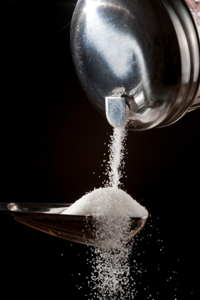 Daily intake of sugar creates a very acidic environment in our systems. As a result, our bodies compensate by “borrowing” minerals from our bones and teeth to regulate and balance the highly acidic environment. This will cause major deficiencies, weakening and decay. In addition, as we consume extra sugar, we experience spikes in blood sugar levels which cause the adrenal glands to release extra insulin. This can lead to storing extra body fat, chronic fatigue, mood swings, and diabetes. Sugar can be lurking in many so-called healthy foods. Certain cereals, yogurts, fruit juices, white breads, etc., contain high levels of processed sugar. Sometimes sugar is disguised on an ingredients list by giving it a fancy name. If you read the labels on some “diet” foods, you’ll notice lots of words ending with “ose” on the list. Fructose, sucrose, lactose, glucose = SUGAR. If you’re not paying attention, you could be taking in far too much. The problem with foods that contain too much sugar, like fruity yogurts, for example, is that your body cannot generate good energy from these foods. Instead, these sugary foods create spikes in your blood sugar, giving you the perception of energy, but it will not be enough to sustain your activities. Your body needs an appropriate mix of quality fats, proteins, carbohydrates, vitamins, and enzymes to achieve the best energy. Below is a list of some healthy alternatives to sugar. You can still satisfy your sweet tooth! Stevia – a great alternative to sugar and sweeteners because of its low-calorie content. Turbinado Sugar & Succinat – These are two acceptable forms of sugar as they’re minimally processed. Still to be used in moderation. Gary Jasmin is a certified C.H.E.K. coach, practitioner and trainer. As part of his holistic approach to health and wellness, he will help you to avoid sugar by prescribing a nutrition and fitness program that is right for you. Click here for more information on nutrition.